If are you thinking about taking advantage of a free trial offer, you may want to check things out before agreeing to a shipment. Before you check the “yes” box and agree to the offer, check things out with reputable sources to see if others have had problems with the product, delivery, or cancellation. Read the fine print, especially if you will be asked to sign up for a subscription, and required to provide credit or debit card information. Pay close attention to cancellation policies and other terms and conditions that could affect things later. Take a screen shot, print, or save information that details the offer, cancellation policies, and other terms and conditions. This information could be helpful if you run into a problem later. If you no longer want to continue with a subscription or receive future shipments, make sure that you abide by the terms and conditions for canceling. 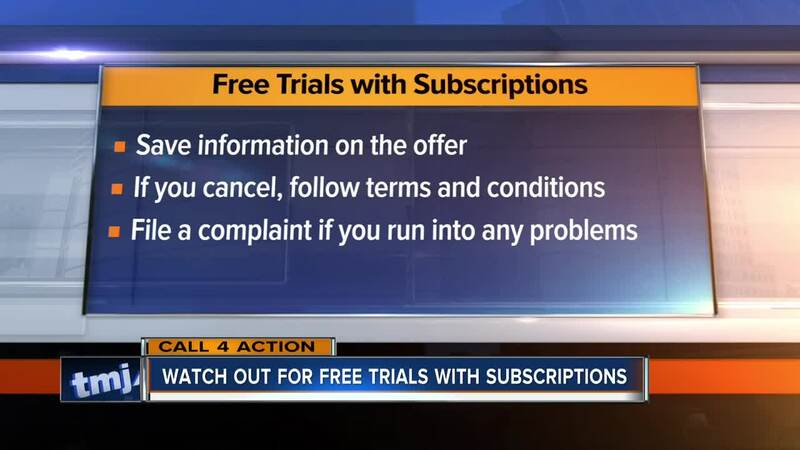 If you run into a problem with a free trial or subscription that you are unable to resolve with a company, file a complaint with state and federal consumer agencies like the federal trade commission. Or, reach out to our Call For Action office for help.